This has been consistently recommended by lots of families as being a great place to go for a family day out. 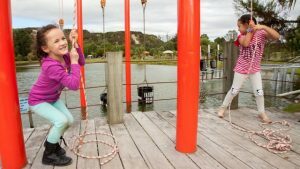 There are lots of things to do and while some families only go to fish for prawns, others never make it fishing and spend their time enjoying all of the the other activities on offer! It’s a good idea to go in the morning as entry allows you to be there all day and there’s certainly enough on offer to make it a day trip. For prawn fishing you can’t take your own fishing gear but they give you everything you need (a basic bamboo rod, bait and buckets of water to put anything you catch in). The friendly staff are happy to give you tips on how to best fish and you can try out different spots around the ponds. There are lots of places with shade cover including on little boats that you can row out. Life jackets are also provided. One end of the ponds has hot water pipes to make heated seats – perfect if the weather isn’t great. There are also hot water foot baths that you can dangle your feet in. Your kids can try and spot prawns and little fish in the water. Around and in the ponds are lots of non-fishing things to do. 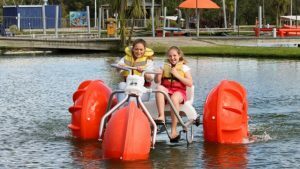 As mentioned there are boats to take out onto the water as well as pedal boats, aqua trikes and paddle boards. There are lots of nature trails including one that’s a treasure hunt and others that include water themed science activities along the way (your kids might get wet with some of these so be warned!) There’s also a play area with swings and plenty of grassy areas to eat a BYO picnic. It’s a good idea to take snacks and drinks into the park with you as you may end up spending most of your day here. There’s also a restaurant onsite where you can have any prawns that you’ve caught cooked up. Some families have commented that it’quite expensive though if you’re buying a meal for the whole family. It’s also worth noting that being surrounded by prawn ponds, there are obviously water hazards all around. Very young, mobile kids that are prone to darting off, might not last long here! Address: 210 Karetoto Road, Wairakei Park, Taupo. Open: daily Summer 9am – 4.30pm. Winter 9.30am – 3.30pm (closing time may vary occasionally). Open all public holidays except Christmas Day. Note that the food in the Restaurant has a 10% surcharge on public holidays. Price: Adults $29.50, Kids (5-15yrs) $16, Students & Seniors (with ID) $22, Family Pass (2A+up to 5 Kids) $75. Preschoolers FREE with paying adult. Taupo rate payers half price with proof of address.